I see now, having become a bit of a birder myself lately with my husband, that I have widened my perspectives to see that each and every creature on this earth has jobs to do. When you get right down to it, few jobs and work tasks are any more important than others in keeping this world going. We frequently ask ourselves what can we do? Sometimes it seems that so few people care, but I am coming around to the notion that many care, we just don’t all care about the same thing at the same time. Believing each one of us can make a small difference may be the most important notion of all. We’ve all had moments we’ll remember forever, being present to catch a magnificent bird in flight, or see a glacier melting before our eyes, even if only on TV. We speak in soft tones about memorable sunsets we’ve seen, maybe when we were young and in the throes of first love, or even much older, sitting on a rock or standing on a bridge for a good view, often with others waiting quietly for it to happen. And then it does. Well remember it forever as ‘a moment in time’ not to be forgotten. Sometimes here we stand astonished to see the first daffodils poke tiny heads through the soil one at a time in the spring, such brave little souls pushing out to bloom after a cold winter, yet still battling bone- chilling cold. Before the grass turns green and flowers bloom with abandon, we can remind ourselves that Mother Nature never disappoints. At our house, in addition to sunsets we can’t forget and daffodils that surprise us in their sudden yellow splendor, my husband and I find ourselves transfixed at the early morning sights of Mr. & Mrs. Cardinal, a pair of Mourning Doves & too many Yellow Finches to count at feeders in the back yard. I know for a fact that we wish we could talk to them, and sometimes do, convinced they are speaking back to us. We have an Eastern Blue Bird that has come several times to visit early on cool mornings, to pose for us on our back deck railing, turning to look straight at us as if to say, “Look. See? Can you believe the beauty of my coloring? Don’t I lift your spirits?” “Yes,” we whisper, through the glass on the French door to our deck. “Well,” it continues,”Here I am. I’m ready for my photograph. Are you?” The answer is usually, “No. Of course not.” Instead we ask each where we left the camera last. Why isn’t it on the kitchen counter next to our bird books? But it isn’t. Instead, we hold our breaths to soak in the bravery of this small bird, willing to interact with us for a short time. Such a little bird, sending us such joy. Lately I’ve begun to look beyond our birds and see cats, dogs, rabbits, squirrels, bees and butterflies, even wasps, spiders, worms, ants and more, understanding quickly how we all have jobs to do on this planet. Our work is cut out for us if we use our talents well. I am thankful I was not made a vulcher, a snake, or even a hornet, though I now have more respect for them, as well. For people like me, who struggle to appreciate dangerous animals or scary ones – grizzly bears come to mind – we can look lovingly at the earth’s bumble bees and not recoil in fear when they buzz by our ears on summer days. We can nurture plants like Lantana and Butterfly Bushes that draws bees and butterflies. We can feed the birds, especially during the winter months when berries are in small supply. We can think about and appreciate that we all have our jobs to do, even if it’s only to plant crops and tend the birds in our own yards. We all have places on earth where we are needed. 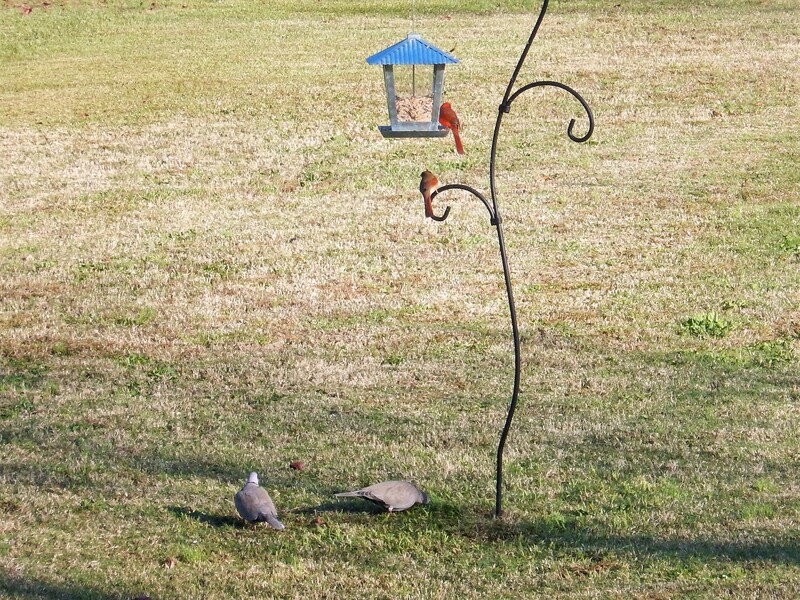 We can think back to the birds at our feeders, or migrating birds that rest in wild places along their journeys. It reminds us to be ever grateful that our world is filled with purpose, the way it is supposed to be in spite of dysfunctional places around this planet. I have never one day in my life worked as hard as a hummingbird beating its wings frantically so many times per second, or a Bar-Tailed Godwit, migrating between Alaska to New Zealand and back, in full seven to eight day non-stop mind-boggling flights, as reported by National Geographic Magazine in its January 2018 issue – Why Birds Matter and Why They Are Worth Protecting. This lead article, written by Jonathan Franzen with photography by Joel Satore, has gone a long way in making me realize that our birds have been designed with purpose, just like the rest of us, as well as our landscapes and climates. It really does make me want to do my small part to help keep this world turning, whether it’s protecting our lakes and streams, cleaning up our oceans, or participating in clean air issues, and let’s not forget about the whales, or all of the endangered birds listed by the Audubon Society. If only each one of us could concentrate on saving our environment, rather than spending every waking moment on wars, hatred, and the hot beds of politics. Each of us. Our own small parts. Just think about that. Think what each one of us can do. How amazing would that be?